The World of Peachtree Publishers: A word from the birders! A word from the birders! Cathryn and John Sill have quite the collection of nature titles to their credit. The husband and wife team have written and illustrated over 19 books together in their About... and About Habitats... series. 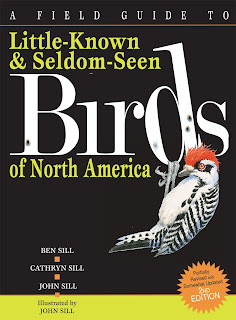 Their latest book, a second edition of the infamous A Field Guide to Little-Known and Seldom-Seen Birds of North America, written in collaboration with John's brother Ben, is only a slight departure from their normal fare. While it does delve into nature and our feathered friends (a favorite topic of theirs), this title takes a look at the seldom seen birds...the imaginary, fictitious and downright ridiculous avian figments of the Sills' imaginations. Avid birders themselves, the Sills have a wealth of knowledge on birds (both real and imagined). Welcome to the blog, Cathryn and John! 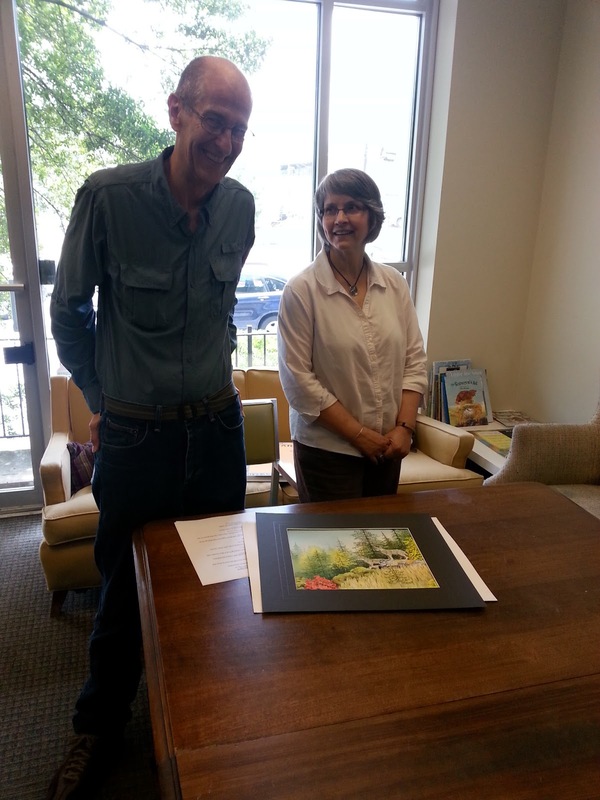 John and Cathryn visiting our offices this summer! When did you first become interested in birding as a hobby? What is your favorite thing about birding now? Cathryn: I remember watching birds out our dining room window with my mother when I was about 3 years old. My parents were nature lovers and introduced us to the wonders of the natural world at an early age. I love watching the behavior of birds and seeing how they react to their surroundings. John: As long as I can remember I have been fascinated with birds. When I was a kid, I imagined myself being able to talk to birds and having them actually understand me. I know now they were just tolerating a pesky boy. Like Cathy, I enjoy seeing what birds do. I also enjoy seeing new species. Ben: Our family always was interested in birds – feeding them, watching, and we always had a pair of binoculars around. My favorite thing about birding now??? Well it is probably a couple of things – 1) seeing a new bird (my North America list is about 515 so it is hard to find new birds in North America), and 2) watching bird behavior is increasingly interesting. Feeding, grooming, flocks flying, etc. Cathryn and John: For both of us, our favorite bird is usually the one we are watching at the time. Ben: I do have a favorite bird – the Swallow-tailed Kite. This majestic bird is my favorite for several reasons – it is large – hawk sized and thus easy to view; its markings are as striking as any bird I know; and its feeding habits – catching insects on the wing – AND eating them on the wing. It is uncommon in the states so to see one is a double treat. How did the idea for your field guides come about? What was your writing process like? Ben: The idea for the Field Guide actually came from Cathy’s mother; they can tell the story better (or with more accuracy, but this is what I remember), but one day she and John showed up at Cathy’s mom’s house from a short birding venture and her mom (also an avid birder) asked what they had seen. Cathy made up a bird and said that they had seen it down at Lake Emory. Her mom, without thinking, and knowing that she had never seen this bird, grabbed her binoculars and headed for her car before realizing that something was wrong. The rest is history. Cathryn and John: When we were traveling on road trips, we would make up bird species to pass the time. We would often see something that would trigger an idea, write the idea on a scrap of paper and stuff it in the glove compartment of the car. One day as we were sharing the ideas with John's brother Ben, he entered into the fun and added his ideas. He looked at us and said "We should write a book!" And the rest is history. The three of us each have a different sense of humor so we were able to work together to have a well-balanced book that hopefully appeals to many different people. Do you have a favorite bird from your field guides? Cathryn and John: When you have a part in "creating" these birds, you develop an affection for all of them. Ben: My favorite bird from the Field Guide (although several would vie closely for the prize) would probably be the Southern Snake Strangler. You have also written and illustrated together many nonfiction books about birds -- what do you love most about these animals that keeps you coming back? Cathryn and John: Birds are a beautiful part of our natural world. While some are readily evident in both appearance and song, others are a challenge to find. We really enjoy the birds that we see at our feeders on a daily basis. We also enjoy going "out in the field" and looking and listening for birds that are not as easily accessible. Ben: I think that the thing that I love most about birds is their ability to fly – and fly with such ease and grace. My training as an engineer was in the area of aerospace engineering. When you flap your arms you see just how futile it is to imagine that we can fly – there isn’t really much substance to air. The fact that birds are not restricted to the flat landscape or to bodies of water, but are free to move “as the crow flies” is pretty special. Check out John's website here, and be on the lookout for About Habitats: Forests this spring 2014!